Alcohol free tickets for drivers and children over the age of 10 are available for $50, please call: 08 8323 6800 to book these special seats. Celebrate Australia day 2014 in one the the most beautiful spots in the country - our cellar door. 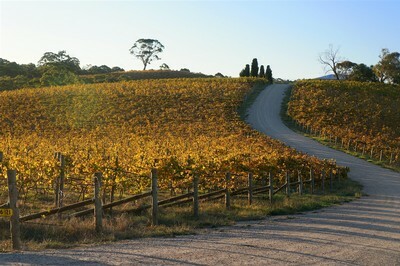 Drive down through the Adelaide Hills to enjoy a relaxed lunch of locally sourced, seasonal Australian produce. Exclusive to our Amici Primo, the day starts with a refreshing glass of sparkling white Primo Secco enjoyed with crostini in the courtyard. This is followed by a selection of wood oven pizzas paired with our most popular wines: La Biondina Colombard and Merlesco Merlot. Lunch ends with a wood oven baked Willunga peach served with our delicious sweet wine, JOSEPH La Magia. Invite your friends to share the fun in McLaren Vale's stunning wine country; the perfect long weekend catch-up. Blend the fennel seeds, pepper, chili and parsley in a food processor to make a dry mix. Marinade the pork cubes by rubbing them in the dry mix, adding a little JOSEPH Olive Oil then leaving them in the fridge overnight in a covered bowl. Spear the marinaded pork cubes onto wooden skewers that have been pre-soaked in water (so they won't burn on the grill). Allow approximately 100g of meat per skewer. Grill the skewers over charcoal for the best flavour. Dress with a sprinkle of lemon zest, a squeeze of lemon juice and a drizzle of JOSEPH Extra Virgin Olive Oil and serve. Many thanks to our friend Rob at La Dolce Vita Catering and Events for this delicious recipe.